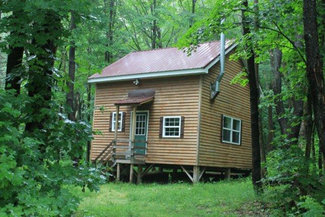 Secluded land and cabin nestled deep in the woodlands with a long 400' serpentine driveway. All the comforts for a woodland hideaway including small kitchen, bathroom, living area and comfortable (stand up) sleeping loft. Borders 14,000 acres of state forest full of ponds, stream and trails. Experience all the Tug Hill Region has to offer as you are minutes from the Redfield Reservoir, Mad River and Salmon River. Priced to sell at $66,900. Contact Matt Klink 315-406-5470 (text friendly) cell for more information and to schedule a showing.